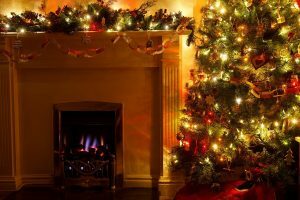 Decorating a small apartment may seem challenging, but there are plenty of ways to add some holiday cheer to your apartment this season! Just because you have a small apartment doesn’t mean you can’t decorate for the holidays! You may need to improvise on a few decorations, but that’s part of the fun of apartment living! Many decorations and accessories will easily fit into your home and will get you in the holiday spirit in no time. If you celebrate Christmas, you may be worried about getting a tree to fit in your small apartment. While a full-size tree is likely not going to work, there are many options out there for smaller trees that will fit perfectly in your living area. Whether you want a real or fake tree, they come in all kinds of shapes and sizes, allowing you to find the perfect tree for your space. Similar to trees, wreaths are a prominent decoration for Christmas. Wreaths also come in all shapes and sizes, but they often don’t even need to be inside. Hanging wreaths on your door or windows saves you space inside your apartment, and spreads the holiday spirit with your neighbors! Every home should have some lights up for the holiday season! String lights provide a cozy vibe to any room and instantly make you happy as you enter the room. White or colored string lights can be hung up in any room you’d like, on the walls or around the windows. Many stores carry packs of affordable lights that are the perfect length for a smaller room. Another cozy feature to bring to your home is a delicious smelling candle. Not only do candles make your apartment smell great, but the flames also provide a very relaxing mood, perfect for staying in and bundling up on a cold winter’s night. Big, fluffy pillows are an essential for the winter season! Comfy pillows on your couch and bed make the room immediately seem welcoming and homey, and of course, extra comfortable. You can bring Christmas cheer to your home by buying red or green pillows or decorate for Hanukkah with pops of bright blue colors throughout your apartment. Whether you need your very first apartment home or are relocating to the area, Apartments of Harborside Village would love to be your dream apartment home. Looking for beautiful waterfront apartments in Joppa, Maryland? Let us show you one of our spacious and affordable apartments at the Apartments of Harborside Village. To learn more about our apartment options, visit us online, give us a call at 410-679-1130, or email us. For a peek at what it’s like to live in our community, follow us on Facebook, Twitter, Pinterest, Google+, and YouTube! This entry was posted on Friday, December 15th, 2017	at 4:54 pm	. Both comments and pings are currently closed.